Now, as slick as your Galaxy S 4 system is, it isn’t perfect. 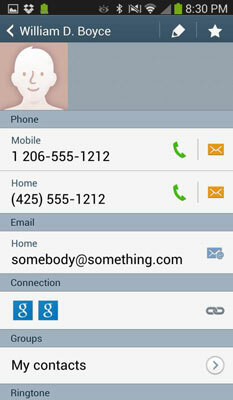 In this scenario, two contacts have the same first and last name. 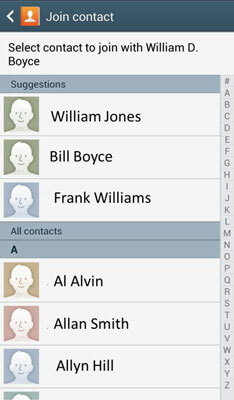 However, if the same person has a different name, you have to link these contacts. For example, if you created a contact for Bill Boyce, but your e-mail refers to him as William D. Boyce, your phone will assume that these are two different people. From a contact, tap on the chain icon. This brings up the Joined Contact pop-up. Choose the contact whose name you want to be the primary name. For example, tap the link on the William D. Boyce contact. That will be the name used on the combined contact going forward. The combined link has all the information on this person.